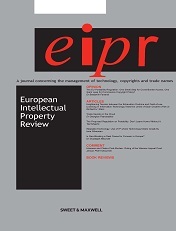 "Hermès in the Lost (Luxury) Paradise: How to Secure Enhanced Well-Known Trademark Protection in China"
Abstract: A series of cases that Hermès litigated in China provide profound lessons for transnational companies to tap into the potential of trade marks in promoting their businesses in China. The first part of this article takes a close look at the trajectory of the Hermès v Dafeng litigation, in which Hermès failed to prove that both the HERMÈS mark and its Chinese transliteration were well-known trade marks in China. By drawing on Hermès v Dafeng and other cases Hermès litigated, the second and third parts provide a nuanced analysis of the key issues for protecting trade marks in the Chinese first-to-file system and for determining the well-known trade mark status of a mark in China. The fourth and fifth parts examine the lessons that can be gleaned from a series of Hermès cases for securing anti-confusion and anti-dilution protection of trade marks in China.